One of the great things about late summer is the abundance of fresh corn, tomatoes and chiles. They are seemingly everywhere you look and too fresh to pass up. 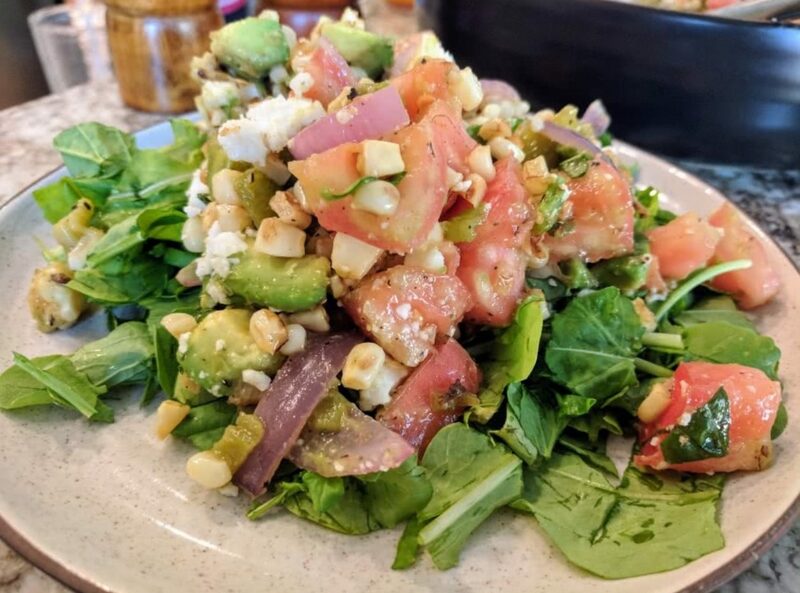 When you find yourself craving a salad that seems more like a salsa this recipe is what you are looking for. Fresh, light, quick and incredibly easy to scale up it will leave you craving more. About 1/4 large. Peeled and cut into large chunks. Shuck corn and remove the kernels from the cob. It is best to cut the kernels using the base of a bowl to catch the kernels so they do not go flying everywhere. Mix the olive oil, lime juice and cayenne pepper in a dressing shaker and shake vigorously and set aside. Foil line a baking sheet and add the chiles, onion chunks and serrano. Broil, about 2-4 inches away from the heating element, the chiles and onion for roughly 7 minutes, until blackened in spots. Rotate the vegetables every 1-2 minutes to ensure event cooking. While the chiles are broiling heat a wok or cast iron pan and add 1 TBSP of grapeseed oil over medium high heat. When the oil begins to shimmer add the corn kernels. Spread the kernels into a single layer and cook stirring only once every minute until the kernels are well caramelized and blackened in spots about 4-5 minutes. When the chiles and onion have blackened in spots remove and set aside until cool enough to handle. Using latex gloves peel the blackened skins off of the chiles and remove the seeds. Chop up the flesh and transfer to a mixing bowl. Slice the cooked onions and transfer to a mixing bowl. Add the tomato, avocado, basil and feta cheese to the mixing bowl. Drizzle in the prepared dressing. Salt and pepper to taste and stir to combine. Prepare a bed of arugula and top with the mixture and serve!